Thought I would get something off my chest. I hate dingers. You know, the people who park up alongside your car, then carelessly open their door into yours, leaving a little ding or dent. Most people aren't dingers. I have never put a ding in a car. I hook my finger round the door so as not to do any damage. But look at any car more than a year old, and chances it it will have numerous little dings in its panels. Who are the dingers? And how do we make them stop! Do they not know they are dinging? Or do they not really care? Now someone close to me who shall remain nameless is, in fact, a dinger. It drives me nuts. I once parked up alongside a brand new £35,000 Audi. Predicting the inevitable, I said "Open your door carefully - that's a brand new..." Ding! And the owners were still in it. Reply: "What's the big deal? It's just a car." Is this a petty and shallow obsession of mine? Should I just get a life? Or is this a TOTAL FRIGGING MENACE?! If so, what do we do about it? Yes, I shall be purchasing a rubber door thingy for our car - but what about others? 1) You had enough foresight to warn your passenger about the new Audi but not enough to park further away. Who's culpable? 2) Any design that requires "careful" operation is flawed. Why do we tolerate doors that ding? Why don't they all have little rubber things from the start? Re 1 - it was on a passenger ferry - I was forced to park close. And in fact most parking areas have marked bays that compel you to park within striking distance of another vehicle. So I am innocent! Is this a petty and shallow obsession of mine? All preferences seem shallow and petty to those who don't share them. Any design that requires "careful" operation is flawed. Indeed. Especially when the device is intended for use by the general public. Plastic auto body pieces don't get dings. Your attitude shows a respect for other people's property that is sorely missing in much of society. Could you have let the passenger out before getting into the bay? I have this ugly red ding on my new green car that just bugs the hell out of me. My best conclusion is that the dingers, as you have dubbed them, just don't care. I mean, yes, it is just a car, and the physical appearance shouldn't be so important to me... but its mine, and I wouldn't do that to someone else, and I'd like the same courtesy. And, I don't think its odd to want to have something not look ugly and battered over time. Dinggers are reducing the value of other people's property. If the Audi incedent had happened in the USA, the Audi owners would have insisted that the dinger paid for the damages. It's no different than if the dinger had backed his/her vehicle into the Audi, causing a dent in the bumber. wombat, the parking spaces in most lots (at least in the US and Canada - I've never been to the UK) are close enough to allow dings to happen. The only way to avoid it is to park at the far end of the lot if it isn't full, or to take up two spaces - and the latter is seen as a jerk thing to do. Jackie - Yep they're just as packed together in the UK, possibly more so 'cos we are used to little dinky cars over here but that's just another case of bad design. I think too much responsibility is being directed at the person who gave the ding (the dingee?). Look at the bigger picture: there are too many cars on the road. Must we increasingly walk on eggshells just so people's precious extensions of themselves be protected? If the government failed to provide intersection control devices (see: stop signs and stop lights) and there were more accidents because of the lack of regulation, the drivers would rarely be the focus of blame. Proof? Go to any country that doesn't have these devices; most vehicles are often dinged, but people usually aren't fighting one another to determine fault and responsibility...it's just a natural part of owning a vehicle and driving. It should then follow that, as a result of mass consumerism and a system that requires more and more people to drive and to park with smaller and smaller spaces, eventually the responsibility is not merely the dingee's. In fact, I feel sympathy for the dingee. Because of the misdirected anger towards the dingee, we are all led to feel as though we must tiptoe around in a world where, really, no ill intention is meant. In the meantime, let's hope (for the sake of the children) that large outdoor china shops don't begin opening everywhere with no guidance on how to maneuver around them and no common sense high shelving. Great timing on the post, I got my first ding on my MINI yesterday. I make of point of parking in spaces that will allow others who park next to me enough room not to let that happen, but the woman driving the car (who I know and like) parked unusually close and there it was. And why is it when I park away from everybody, I come out to leave and I'm surrounded by cars? I have scant sympathy with people who moan about being dinged - maybe because my car was heftily biffed on that snowy Monday early in February while parked outside my house in my disabled bay by a stupid woman who was "surprised that her brakes didn't work" when she tried to turn a corner far too fast and skidded straight into me. It has only just been returned by the repairers after five and a half weeks. You could make the same argument that we should shut up about the littering because people shouldn't have to go out of their way to throw their garbage in the trash can. I deposit my trash in the provided containers, and I expect others to do the same. When I get out of my car, I make a point not to damage the car next to me. I expect others who park next to me to do the same. It's a matter of personal responsibility. Whether or not we rely too much on driving for transportation is irrelevant. No, I don't think the same argument holds for littering in the way that you've presented it. Put it this way: if parking spaces allow enough space between cars for a door to be opened to its fullest extent, then any dinging would be the responsibility of someone who didn't park in the spot correctly (i.e., too far over instead of in the middle). However, if the spaces are so tiny that even a small person (like myself) is unable to squeeze out without making contact with the adjacent vehicle, then the responsibility is not entirely mine, no matter how courteous I attempt to be. Keeping with your littering comparison, I would not fault a person for littering if every trash bin were full and there was no systematic removal of waste. I return to my original argument: though I'm a greenie from Vermont, I found it impossible to fault people in underdeveloped countries when I saw them "littering." Trash was everywhere, and so there was no way to distinguish between "littering" and being "responsible." This is my point and why I think it IS relevent to how reliant we are on individual large transportation vehicles: with so many existing vehicles that parking spaces have become impossibly small, I think it's difficult/wrong to fault people for the minor dinging of vehicles. Your littering comparison was helpful, I think, in illuminating where the idea of personal responsibility can reach a limit and become simply absurd. That kind of negligence is really inconsiderate and disrespectful in my opinion. They wouldn't like it if you did that to their car. I'd understand if it was an innocent mistake, and someone leaves you a note with their contact information (that's taking responsibility for your actions). But when people are just like "screw it, it's just a car," I really want to reciprocate in kind if you know what I mean. Makes me long for the good old days when it was "an eye for an eye," but alas, life isn't that fair. Get a silver car, the dings aren't so obvious. Besides, dings are inevitable, and, as careful as you can be, always parking to avoid such things, some dickhead will manage to do it. I bet you get pissed when you scratch the screen on your phone, or shiny iPod, or laptop screen and so on. I also bet you hate people touching your laptop screen too. I'm like this. However, when it happens, it is done and I soon get over it and more relaxed when the object gets what is essentially superficial damage. It's amazing that this topic has attracted so much comment - everyone has experienced it. My car is now 9 years old (I bought it new) and the biggest ding was caused at the Dealers during a service. But I can't complain when most of the scratches on my car have been caused by my own carelessness - like putting a ring folder on the roof while I opened the door and then leaving a lovely white (against China blue) scratch when I removed it. My car is a 2 door hatch which means the doors are wider than normal so I'm extra careful, and I do let my passengers out (or in) first (or after) when the parking is tight. And even when the parking isn't tight I always ask my passengers if they have enough room, which is a tacit way of letting them know to be careful. 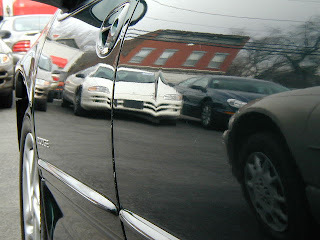 Actually, I'm most worried about resell value of my car, not esthetics. No one's going to buy my used cell phone, so it doesn't really matter if it's scratched or pained with nail polish or plastered with stickers. Although, scratches on the screen would annoy me. Anyway, I don't see what's so hard about opening the door slowly so as not to dent or scratch the car next to you. Let's face it, people will of course be irresponsible whenever possible. The fault lies with automakers. You can't dent fiberglass. Dingers are very annoying. It isn't the cars that they are showing disrespect for, so how they feel about cars is largely irrelevant. The issue is how they feel about the people who may be financially culpable for their ignorance. As far as I'm aware it is very difficult to hone one's inconsideration in these matters to such a degree that one can guarantee only denting a car without scratching it. "Or is this a TOTAL FRIGGING MENACE?!" As an isolated example of callousness, no it clearly isn't. But as others have pointed out it is symptomatic of a larger problem that probably can be described as a "TOTAL FRIGGING MENACE". Unfortunately, we have some who sport that attitude that graciousness is something that should be mandated by government, or remedied through design and technology. i.e. the idea of actually appealing to human nature is somewhat out of fashion. Again. Why bother with philosophy when you have law and technology? Technology is not an excuse for churlish behaviour but neither is graciousness an excuse for bad design. Once the design is fixed you can still express delight with the other car or its owner in plenty of other ways (flowers under the wipers?) or contempt if that is your wish but it will be deliberate not accidental. The exterior of the car is just a shell; the really important stuff is on the inside. On the other hand, a car is a major expense for most individuals, and that is why people care so much about their appearance. There's a lot of investment in them. Would your friend just shrug it off if some kid egged their house? It would be an odd person who said, "it's just a house." the ding criminals will get dinged themselfs?